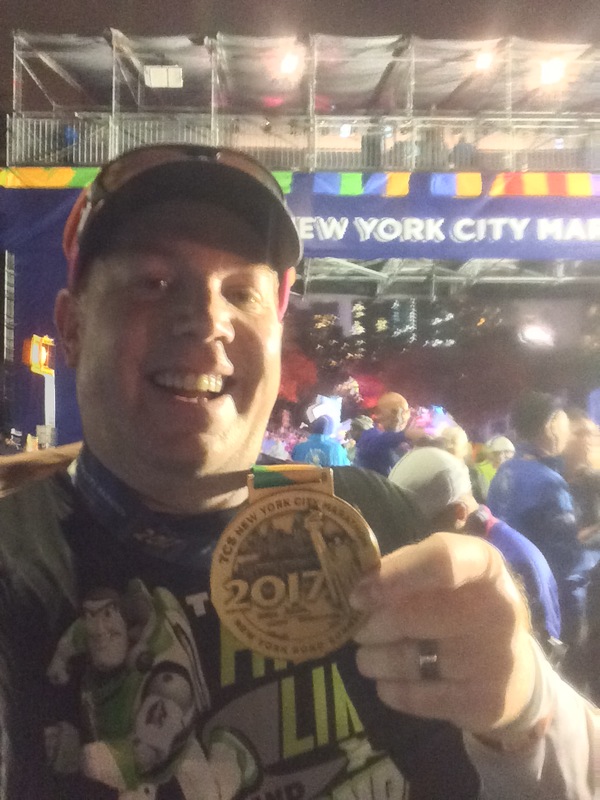 For the first time in forever, I ran in a race! 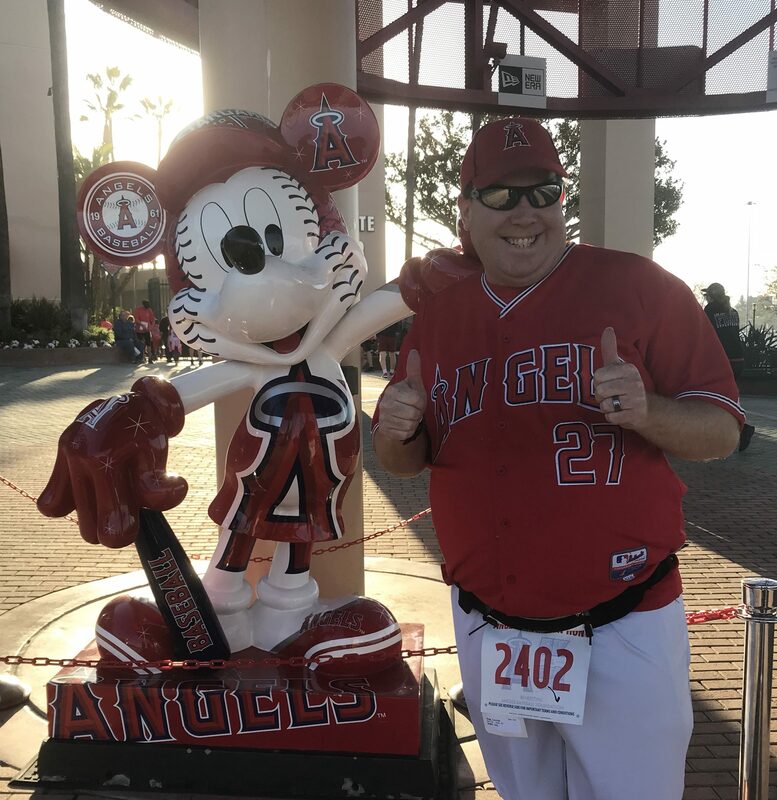 As I drove down to Angels Stadium, I realized that it’s been around 6 and a half months since I ran the TCS NYC Marathon. That’s 6 and a half months to trying to remain motivated while watching so many of my running friends run in many races. I even had friends racing at WDW this weekend as part of the Star Wars Dark Side Half Marathon Weekend. Even though this wasn’t a Disney race, I had to get some Disney in. Especially since we have our own Angels Mickey Mouse at the stadium. Honestly, once I got parked, I think I smiling the whole time until I left the parking lot. One of the things I love about this race is that I can pick up my bib on race day. 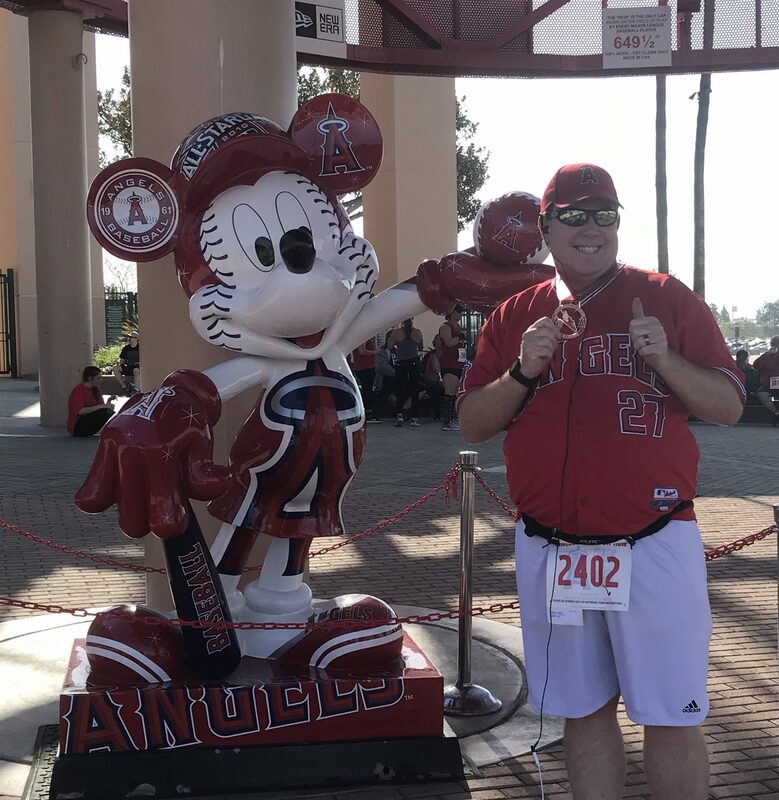 This was my 5th time running the Angels 5K and have never had a problem getting my bib on the day of the race. The only hiccup came with getting a race shirt in my size one year. Other than that, it’s pretty easy. 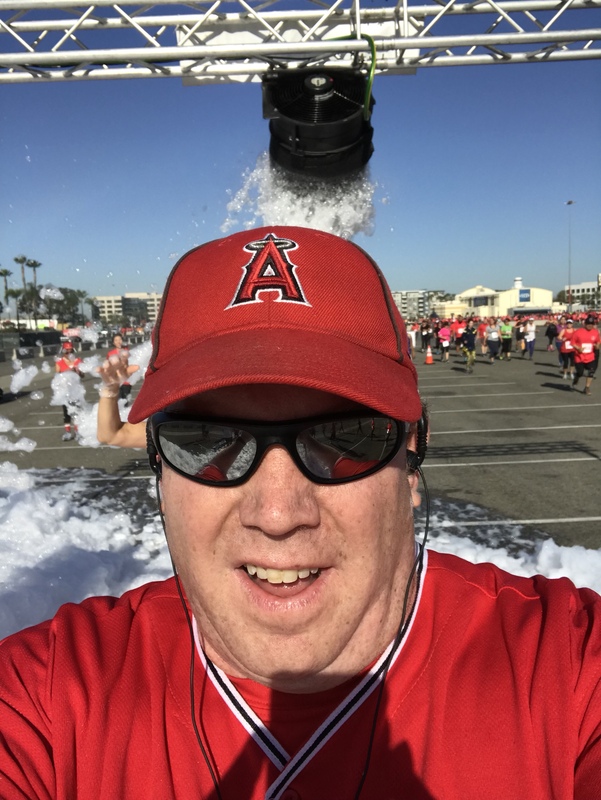 Another perk of this race is that they open up a few restrooms in the stadium for you to use. There are a few port-o-potties around as well. Before the race, they had a little festival set up for us to entertain ourselves. This festival remained up for at least an hour or two after the race. There were a few cut-outs for you to pose for a picture in. And, there was staff there to take your picture. Around 20 minutes prior to the start time, I headed into the corrals. I spotted a few folks with runDisney shirts. We spent some time talking about how much we hope runDisney returns to the west coast. We all miss the races out here. I loved being among runners again! One thing about this race, though, is that there is just one massive start. No self seeding. No signs out to try and put yourself in the correct pace group. It was one big massive start. As I drove down to the stadium, I did think a little bit about how I was going to approach this race. After all, I have done no runs in the 4 weeks leading up to this race. There was no workouts. So, felt pretty unsure as to how I should even start. Eventually, I settled on a run a minute, walk a minute intervals. I had no idea of how long I could hold those intervals or how it would turn out. But, I needed some sort of game plan. After the national anthem, it was time to start the race. 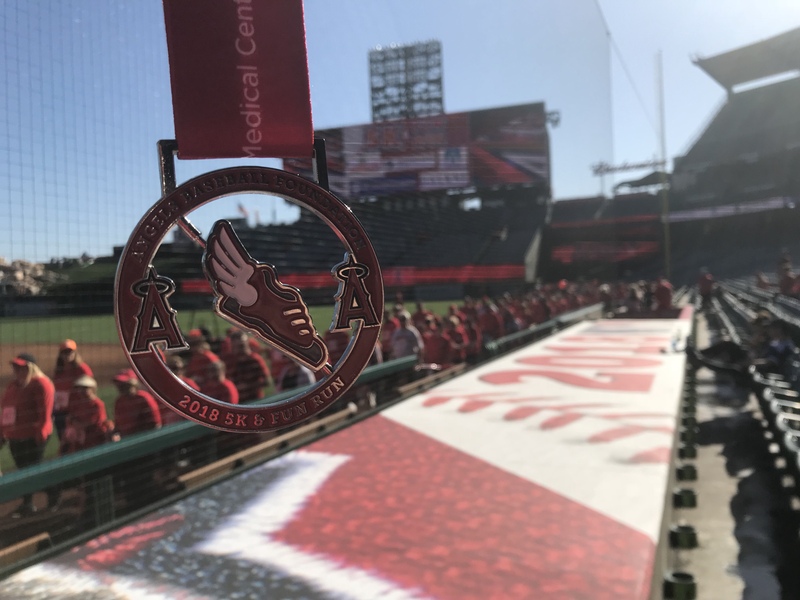 I do love that Rodger Lodge (a guy who hosts an Angels radio show) does the MC’ing for this race. He’s perfect for it. 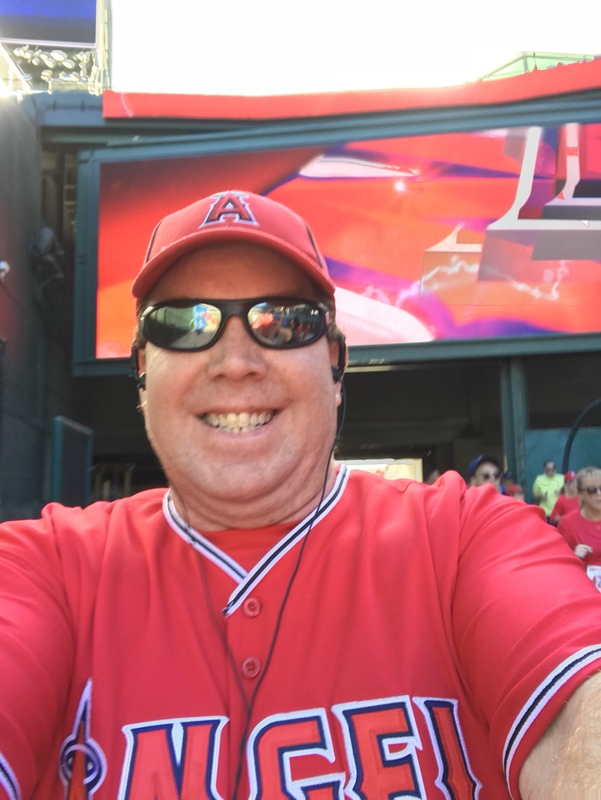 I should say that, before the national anthem, he has us all turn to face the stadium and say “Angels Will Win” in an attempt to break the Halo’s 4 game loosing streak. 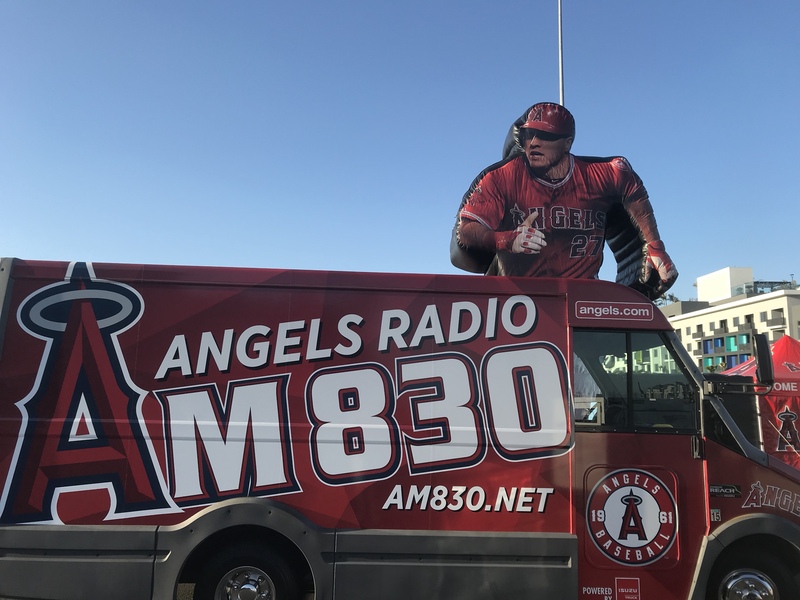 Guess it worked because the Angels won that night! The first quarter-mile was pretty rough because of crowding. After 30 seconds of trying to run, I gave up for 30 seconds. Then, I saw enough clearing to actually run. 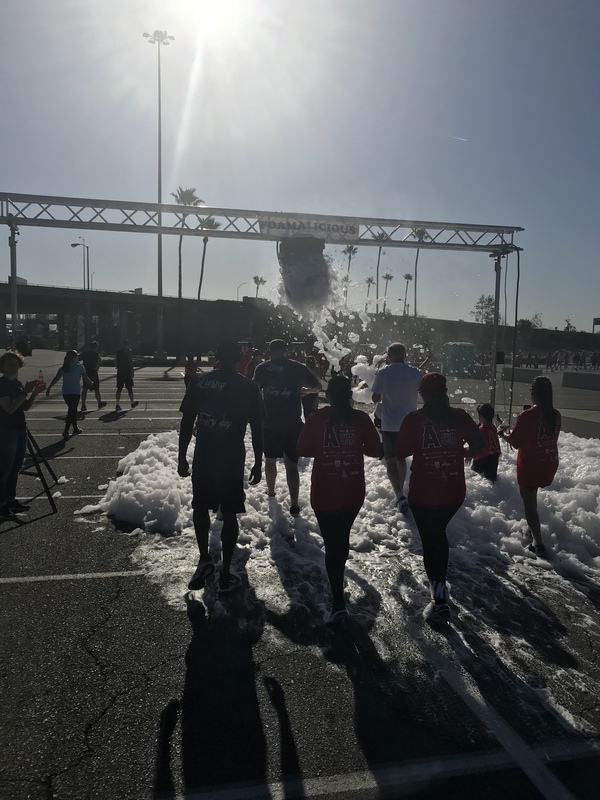 I ran for around 2 minutes to get me to the end of the first quarter-mile. Then, I settled into a run a minute, walk a minute intervals. I finished the first half-mile (according to my watch) in around 5 and a half minutes. It wasn’t too bad. I didn’t even look at the route for this year’s race. Since I wasn’t chasing any sort of goals, it was fine. However, they have sure changed this course from the one I ran two years ago. We spent most of the race running around the parking lot. 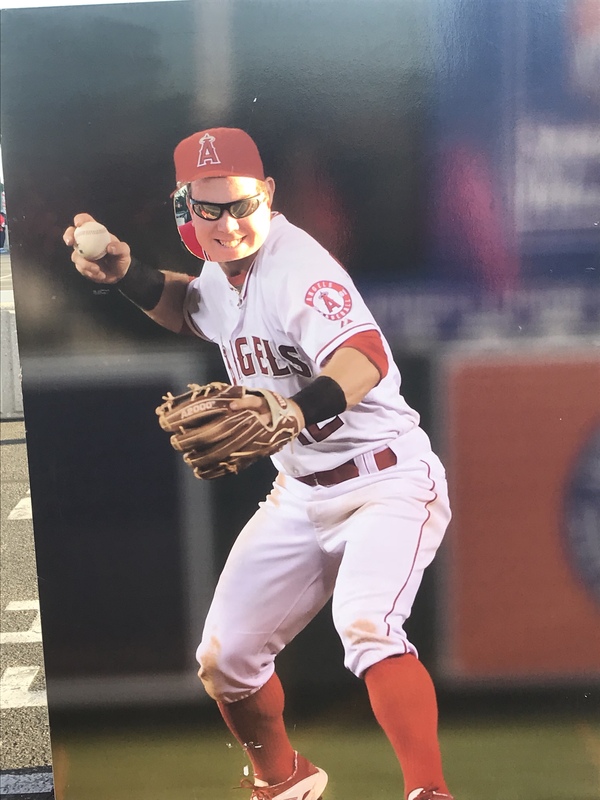 They did have cut-outs for you get pics with along the way. The bummer for me in the race is that almost all of them came at the start of run intervals. Mike Trout was up first towards the end of mile 1. Talk about a place where I had very little motivation to stop for a pic. I wanted that first mile to go well. Stopping would kill my time. I finished mile 1 in around 11:30. This is a fantastic time for me! 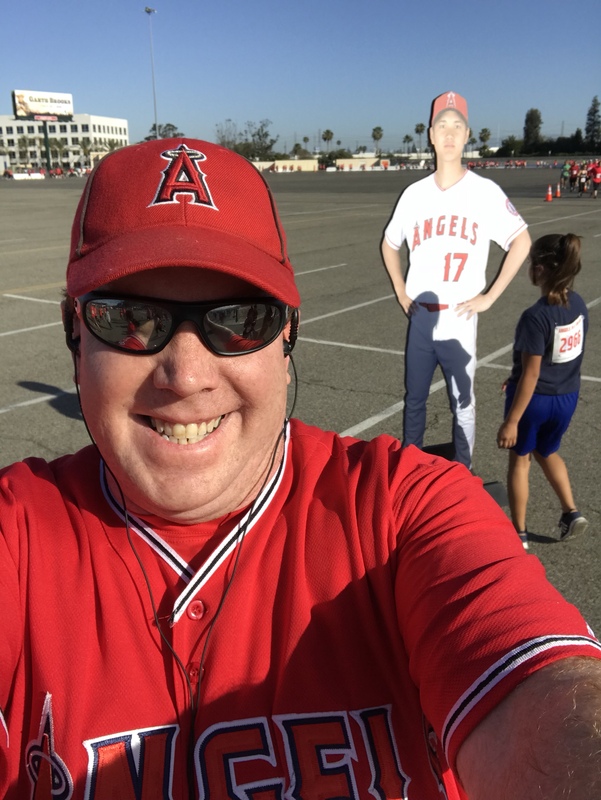 Towards the end of mile 2, they had a cut-out of Shohei Ohtani, the Japanese Babe Ruth, and Angels rookie. The line was too long. So, I stopped for a selfie. I was on track for finishing the second mile at 24:30. Stopping for the pic pushed my time to 25:00. I could tell I was slowing down right around a mile and a half. It’s okay, though. This race was about seeing where I was at. Evidently, I didn’t go through the right part. I didn’t get covered or anything. 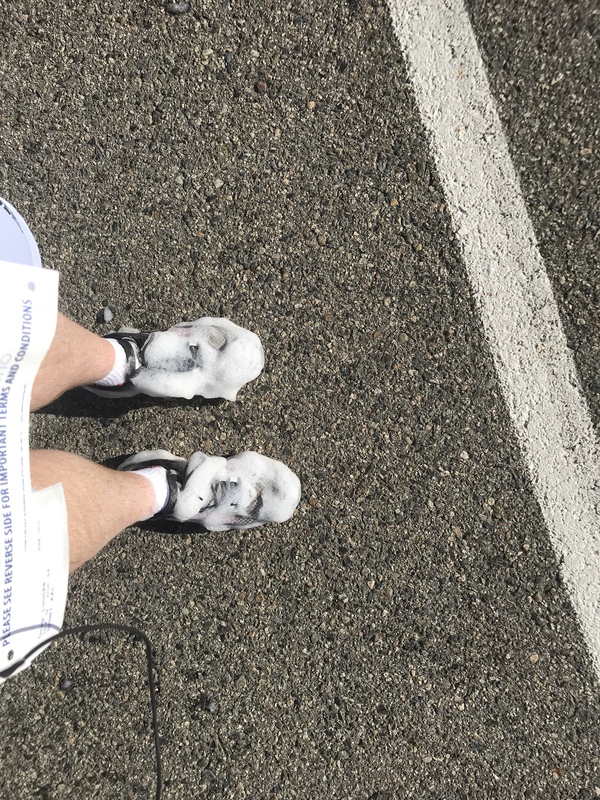 However, my shoes got covered. 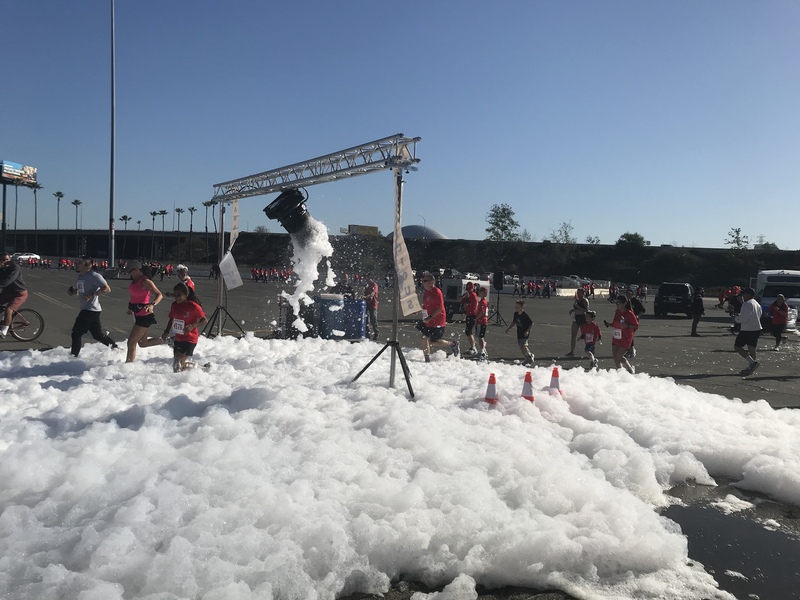 There was another bubble area as we approached the stadium. One thing I need to mention before going on, though. We didn’t have a water stop until around 2.30 miles. I mean, why even bother at that point? We had less than a mile to go. So, I totally skipped the water. I’m used to this in training. But, this is my only complaint with this race. With so much of the first 2 and a half miles in the parking lot, they could have easily put a water stop at the exact mid-point. 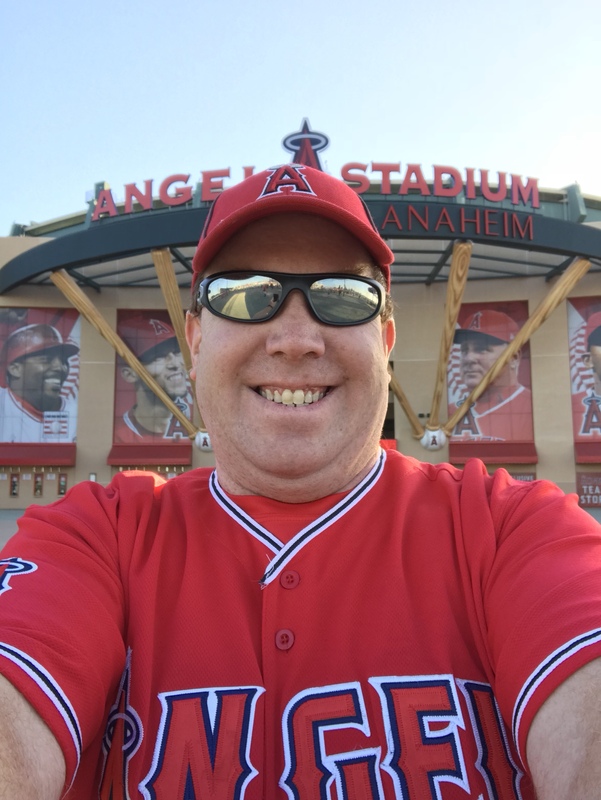 Anyways, it’s always so much fun to run into Angles Stadium! This is why I love this race. This is why I ran this race for two years before they started giving out medals. Ah! Look at that view. 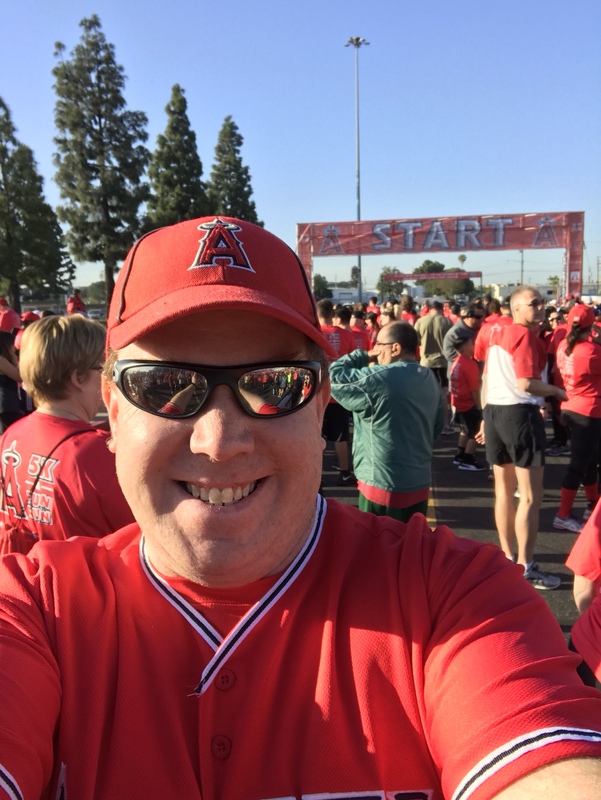 I know that this isn’t like what we see (before 2017) when we ran the Disneyland Half Marathon or the Avengers Super Heroes Half Marathon. There was next to no one watching. But, still so much fun! I completely abandoned my run/walk intervals once I got inside. After all, I wasn’t on a PR pace. So, why not have fun with picture taking? Am I right? 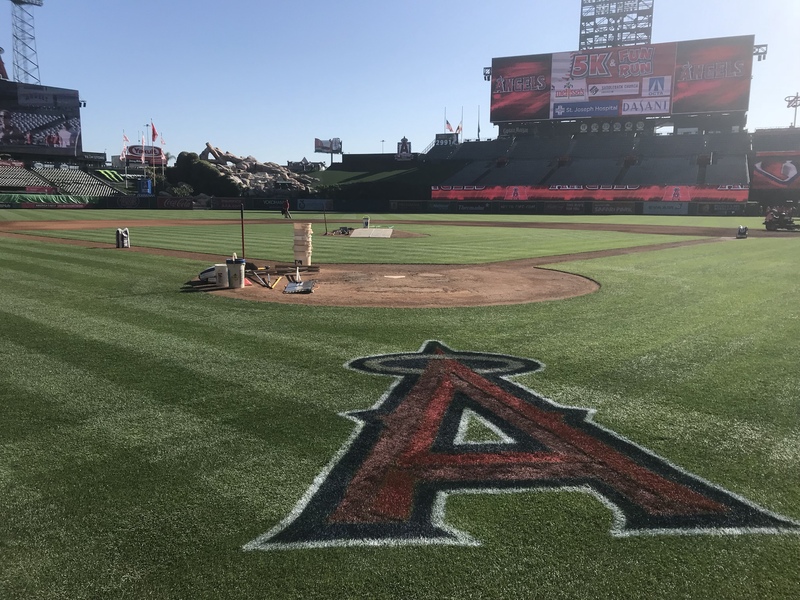 Every time I run by home plate, I wonder what it must be like to be an actual MLB player who gets this view whenever they play at the Big A. 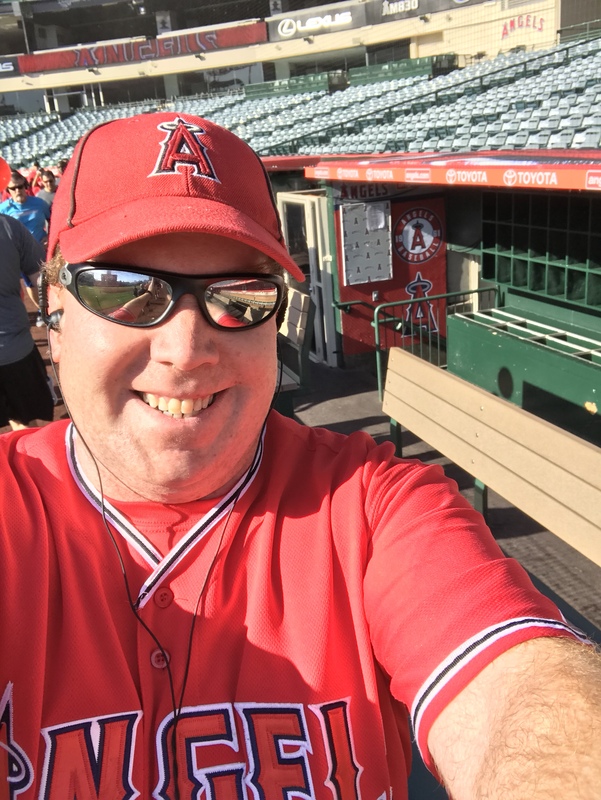 On the way out, I had to stop for a quick pic by the Angels dugout. After this pic, I saw myself up on the jumbo tron. There was a runner next to me pointing up at the screen (because they saw themselves). So, I looked up as well. I tried to get a pic, but my phone was on selfie mode. Oh well, I was ready to finish. 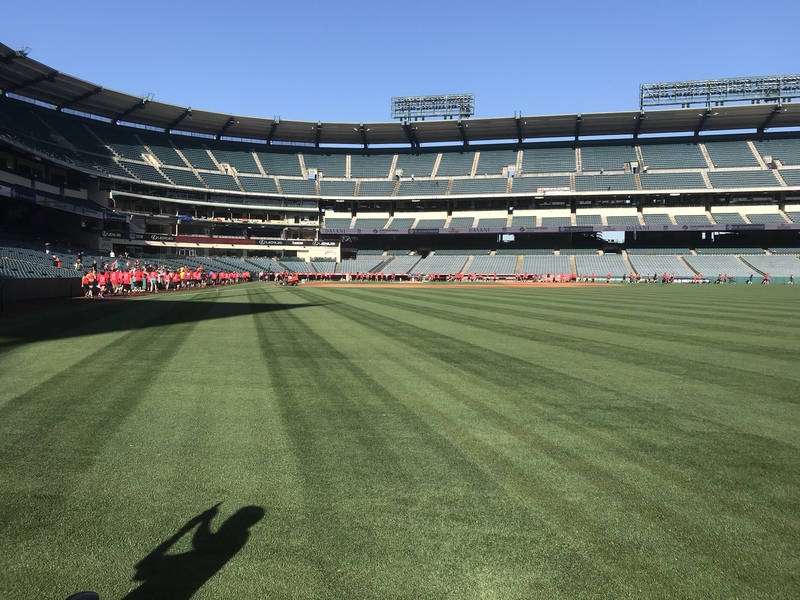 Then, before I knew it, we were out of the stadium and in the final stretch. By the time I got out of the stadium, a 39 minute finish was out the window. I knew I’d be around 40 minutes. So, I thought of how I wanted to finish. 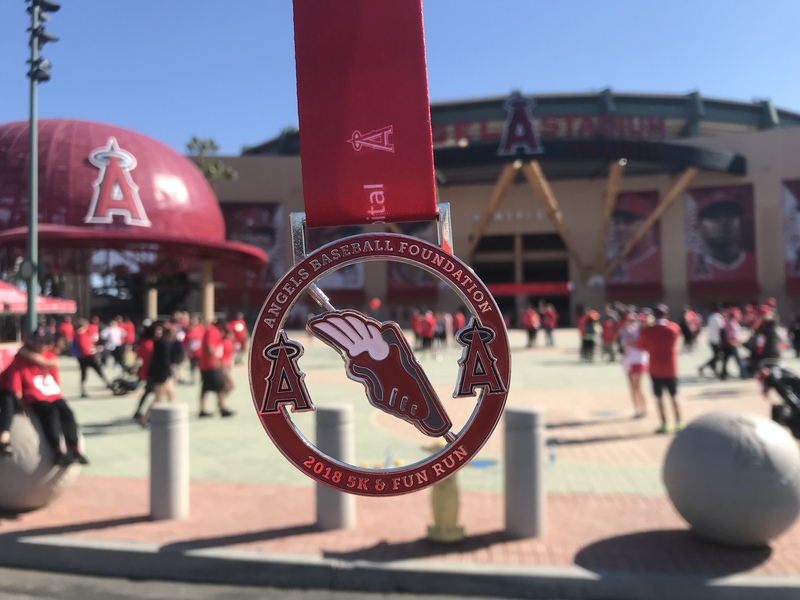 There was no run/walk strategy. I ran a little, walked a little. Then, it was a sprint to the finish line. My official finish time was 40:38. Not bad for a guy who didn’t train for a month prior to the race. Of course, afterward, I had to take the medal for some fun medal photos. You know what I mean? First up? Mickey Mouse. 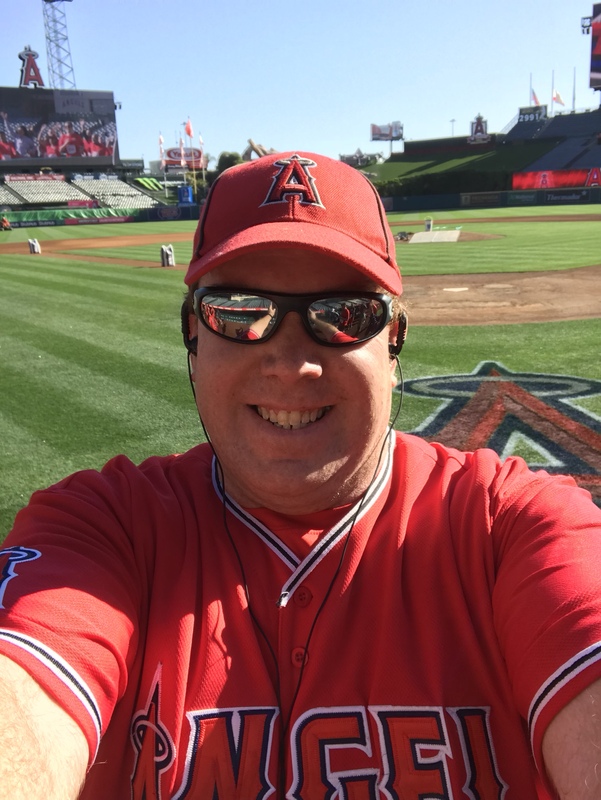 Then, inside the stadium, I found the perfect spot. 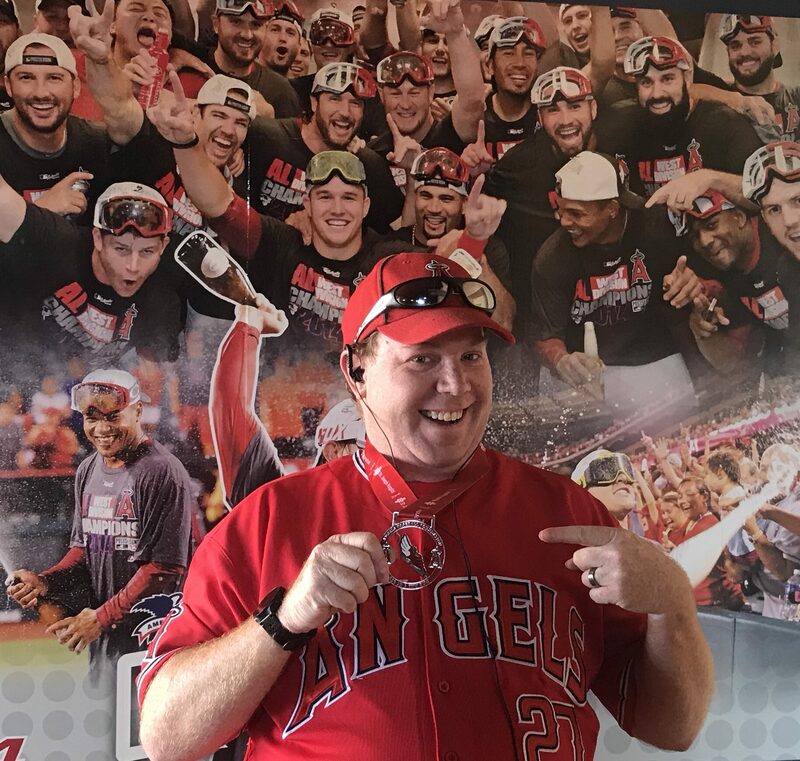 I think Mike Trout and the gang are pretty happy for my finish. Don’t you think? Then, I headed inside. As you can see, there were plenty of people who finished behind me. 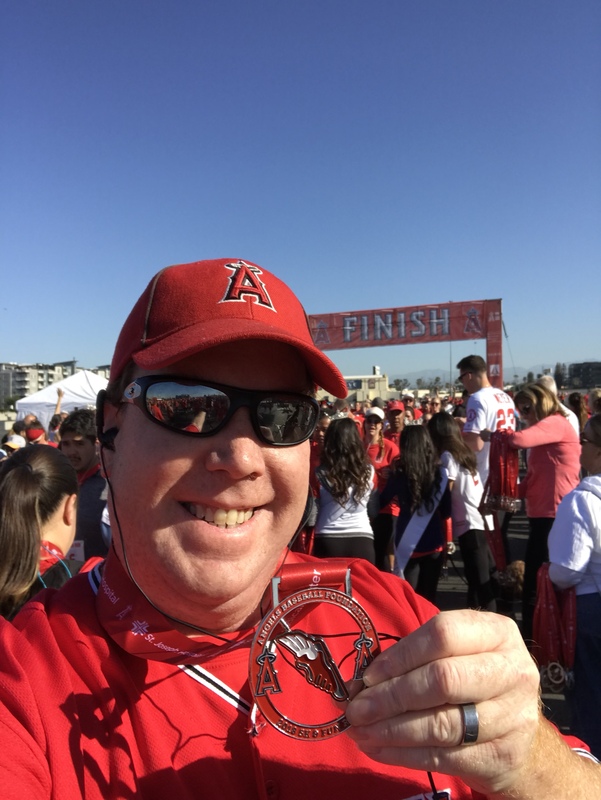 I had a blast getting out and running a race again! 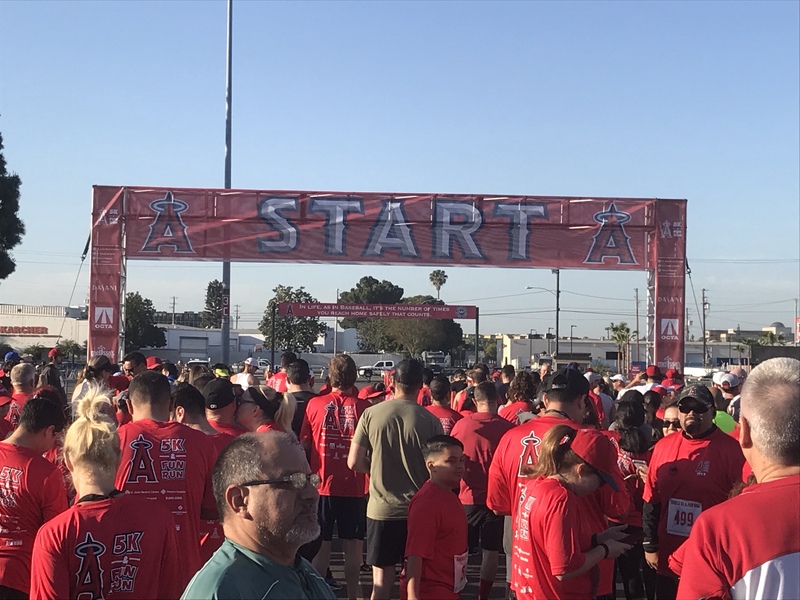 The Angels Baseball Foundation 5K is one of my favorite 5K’s. The misplaced water station aside, this race is one I hope to do every single year. Thanks to the organizers and volunteers for putting on a great race. I will be back next year!